This is a licence to occupy agricultural land and/or buildings for non-business use. Typical uses might be for keeping horses or other animals, personal storage of vehicles or other possessions, and recreational riding (for example, in an arena). This document has been drawn for land of an agricultural nature, where care of the land by the licensee is important to the owner. The property could be a building (such as stables, a barn or a workshop) or a set of buildings, or land of any sort including fields, woodland and orchards, or a combination. The law in this document is common law, giving you greater flexibility to decide your own terms with your licensee. Important to the licence remaining as such, and not becoming a lease (giving more rights to the tenant) is that the landlord retains access to the land at all times and remains in control of and responsible for services (such as electricity and water) and larger maintenance works. 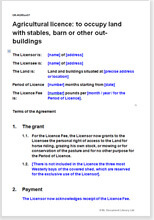 Limiting the use of the land, the term of the licence (to less than a year, ideally 6 months and renewed as necessary), the times of access, and particularly what the licensee may do will help the agreement be seen as a licence rather than a lease. You should use this document to license agricultural land and/or buildings to an individual only. If the land is to be used for agricultural business (such as farming), then a farm tenancy agreement is required. It may be possible to use a grazing agreement if the licensee is a farmer using the land solely to graze his livestock. For any use agreed, except business and residential. The advantages of using an agricultural licence agreement rather than a lease are that the landlord has no requirement to give advance notice to access the land or to end the agreement.